The epic swell that set off an all-time Teahupoo on November 1 of last year ended up providing more than just breathtaking waves and jaw-dropping images. Following the Billabong XXL Big Wave Awards, it also sent surfers Shane Dorian and Manoa Drollet, as well as photographers Gustavo Camarao and Jeff Flindt home with much deserved awards that altogether totaled $62,000. The Big Island native and big-wave pioneer Dorian took home the highest honor of the evening when he was awarded Ride of the Year. He somehow pulled into a section of Teahupoo that few live to tell and was spit out into a full cart-wheel. It was an unbelievable ride, and one that sent one of surfing’s legends and all-around good guys home $50,000 richer. With just a smidge more than a week left until the 2008 Billabong XXL winners are announced, I decided to take another run through and check out the finalists for each category. Now wrapping up it’s eighth year of running, the Billabong XXL is building prestige and helping to progress and grow big-wave surfing in ways beyond imagination. Hundreds of entries are coming in from breaks all over the world, many of which were unknown until recent years. Each year the entries get crazier and more difficult to fathom. 2008 has undoubtedly seen that trend continue. It’s going to be difficult to decide where the $50,000 grand prize for Ride of the Year ends up. Take a look at this years entries and I’m sure you’ll agree. Mikey Brennan’s Shipstern beast and Carlos Burle’s Ghost Tree ride were both mind-blowing in their own right. However, I would have to guess that this years winner will come from one of three entries from waves ridden at Teahupoo. Ian Walsh, Shane Dorian, and Manoa Drollet all pulled themselves into deep monstrous lefts at the famed break, and in doing so have given the judges work to do when deciding who to hand the $50,000 check to. 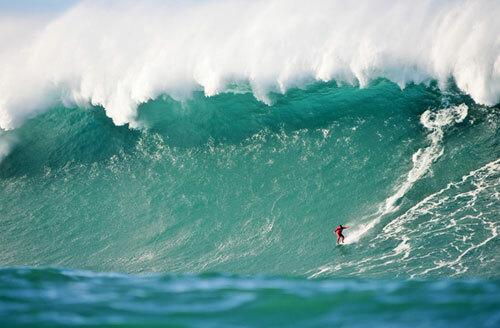 When Billabong launched it’s initial XXL Global Big Wave Awards competition almost eight years ago, it was said that the unveiling of the first contest of it’s kind was only the tip of the iceberg when it came to big-wave surfing. Now with just one month left to go in the entry period for the 2008 awards, we’re starting to get an idea of exactly what that meant. When word that a contest of this type was first coming out around 2000, I, and I’m guessing many others as well, basically assumed that the winning entries would annually come from the bellies of the beasts we know to be Jaws, Mavericks, or Cortez Banks. As big-wave surfing has grown and expanded all over the world, other jaw-dropping, bone-crushing breaks have introduced themselves to the surfing community and have made the Billabong XXL truly an international event. With still four weeks left in a year that has produced some of the largest and heaviest waves ridden to date, Billabong is already shattering previous marks with over 420 entries already submitted. Equally remarkable as the quantity of submitted entries has been the diversity of the locations that they are coming from. With videos and photographs from Chile, Tahiti, Western Australia, South Africa, Mexico, Tasmania, Spain, the British Isles, and France among others, this contest has gained interest from all over the earth and has helped lift big-wave surfing to new heights. 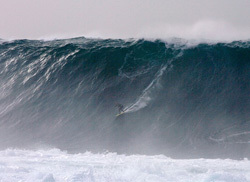 So just how high are these ‘new heights’ that the Billabong XXL as well as big-wave surfing in general are reaching? One of the recent entries, and my new favorite to load up the $50,000 at the Billabong XXL Awards ceremony this April 11 at the Grove Theater in Anaheim is the shot of a truly epic monster at Belharra Reef off southern France being ridden by Vincent Lartizen of Hossegor. When I first laid eyes on this shot I simply found myself speechless and staring dumbfounded at my computer screen. To me it comes across more as a natural disaster than a surfable wave, and captivates a truly epic display of skill and bravery. It’s nearly impossible to fathom guys charging anything larger than that. With that being said, I learned my lesson a long time ago that with surfing, anything is possible. Bringing a close to surfings first ever major virtual surf competition, the Billabong Freewave Challenge announced their winners today of the unique contest that was held on Oahu’s North Shore and began Oct. 1 of last year. The results are in, and they come as no surprise to 5ones (we picked the winners a month ago). Top videographers on the North Shore were also acknowledged for capturing the critical moments of the big wave season on tape. O’Brien’s Rodeo was shot by Pete Frieden & Graham Nash and O’Brien’s Freak Out Turn was captured by Kendall O’Brien. The Reyes tube was shot from four angles by Pete Frieden, Tony Heff, Graham Nash, and Marc Beaty of Surfline. With the very successful completion of the first Freewave Challenge, the details of the next event are now being released. The next event will take place on the Mainland USA from May to September, and all surf breaks on the West, East and Gulf Coasts are eligible for any ride NOT taking place during a regular surfing competition. As previously mentioned, Billabong has put on it’s first ever virtual surf contest. Between the months of last October through December, surfers were given the chance to film anywhere on the North Shore and submit entries of their favorite rides. Anyone interested in viewing the other clips that made it to the final five can head over to FreewaveChallenge.com and see what you think. There are some pretty epic rides and this appears to be a really tough decision. The final rankings will be counted down from fifth to first places beginning Feb. 1, 2008 and $40,000 will be handed out among the winning surfers and videographers. Billabong’s Freewave Challenge threw a twist into surfing competitions and opened up the doors for all competitors, surfers and videographers alike, to win some serious prize money outside of the arena of typical contest surfing. The competition officially began on Oct 1st of last year and is now in its judging period. Taking place in surfing’s epicenter, the North Shore of Oahu, contestants had from Oct. 1 until the clock struck midnight on Dec. 31st to submit video of themselves on their best waves. The competition is broken down into two categories: Best Performance Ride and Best Tube Ride. Any worthy ride on a wave not occurring during a regular surfing contest is eligible. With out any qualifying tour, elimination rounds, or any ’standard’ of what constitutes the best ride, this contest became one of the most inclusive and gave equal chance to local-legends and pro-surfers alike. Video clips of contender rides were required to be uploaded to the FreewaveChallenge.com hub by registered videographers in the specified time period where they were to be viewed and rated by surfers and fans from all over the world. Now that the entry period has concluded the most popular and frequently viewed videos are being judged by some of the top names and top journalists in the industry. The winners will be announced at an awards party later this month and $40,000 in cash and prizes will be given to the winning surfers and videographers. With so much being made yearly about the standard used to judge the majority of surfings big events, it will be interesting to see what ends up being deemed the best ride. It also opens up the door for surfers who aren’t as well known and may not be ‘contest’ surfers to throw down something sick and walk away with a big stash of loot and a lot of recognition. And it appears Billabong has been quite pleased with the success of this new style of contest as they will announce the date and location of the next Freewave Challenge at its awards party. Cheers to Australia’s Bede Durbidge for winning the 2007 Billabong Pipeline Masters, clinching the Van Triple Crown of Surfing title in the process. In a contest that saw the legendary career of surf legend and Australian-icon Mark Occhilupo come to an end, fellow country-man Durbidge pulled off the victory by throwing down a near-perfect 9.5 ride early on in the final heat and never looked back. In the process, the 24 yr. old up-and-comer from Queensland, unsponsored and financing his own way around the world, won himself over 75,000 dollars in cah and prizes with his victories. That will go down as the biggest single-day gain in the history of professional surfing. With this years world title already being wrapped up by Mick Fanning in Florianopolis, Brazil, the small and inconsistent surf did nothing to help give the Pipe Masters contest the drama and intensity that has made it the premier event of the year in the surf world. Maybe it was only fitting that today’s final was held at a break known as ‘Off the Wall’, which is located about 100 yards down the beach from the most famous wave in the world in three-foot surf. The lack of waves was probably the culprit for the scarcity of local Pipe riders in the final heats. But even the lack of typical Pipe Masters conditions couldn’t keep top surfers like Bruce Irons and Fred Patacchia, both of whom were on the bubble for making next years tour, from qualifying to surf full-time on the 2008 ASP world tour next year. So a big ‘Congratulations’ goes out to Durbidge, who I am sure we will be hearing a lot more from in the coming years. And here is to hoping that 2008 brings back the mind-blowing barrels that has made Pipeline the legendary break that it is today. Billabong relaunched their girls site today with a whole new look and feel. They also added a new section to the site called ‘be social’ with features like contests, video clips, photos, interviews, and a blog. To be honest, I’m not very impressed. Don’t get me wrong, the design is great. But I expected a lot more from the ‘be social’ section of the site. What is it about this industry and failing to keep up with innovation on the web? I mean seriously, there’s nothing even really social about the site at all and to me it sounds like they’re just trying to hop on the bandwagon by using the latest buzzwords. First of all, the only portions of the site that are actually social by nature aren’t actually on the Billabong site. Instead they’ve included links to their MySpace page (which is pretty bad itself), Fantasy Surfer, and their blog that’s on Blogspot. Come on! Blogspot? My mom hosts a blog a Blogspot. It’s no place for a brand or company to setup a blog. Instead they should have set one up on their own site. At the very least they could’ve added a forum. Even though forums are becoming dated at least it would allow people to communicate and actually ‘be social’.